The M-7000 series of I/O modules provide a wide range of distributed intelligent sensor interfaces. Systems can be designed using the various I/O module building blocks. The M-7000 series communicate using the popular Modbus RTU protocol (ICP DCON is an option), allowing for simple connection to most SCADA & Monitoring packages, such as our Orchestrator software. A sample of the available products can be found below. For details on the full range or to discuss your requirements, please contact us. M-7016 Strain Gauge input module featuring 2 input channels, excitation voltage output plus 1 digital input and 4 digital output. Communication is via ModBus RTU or DCON protocols. GPS Receiver unit with 1off Digital Output and 1off Pulse per second output (for precise timekeeping). 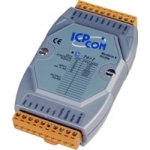 Communicates via Modbus RTU or DCON protocols. M-7017 Analogue Input (V/mA) module featuring 8 differential channels and communicating via ModBus RTU or DCON protocols. M-7017C Current Input (V/mA) module featuring 8 differential channels and communicating via ModBus RTU or DCON protocols. M-7017Z Analogue Input (V/mA) module featuring 10 differential channels (20 single-ended) and communicating via ModBus RTU or DCON protocols. M-7018 Thermocouple Input (also supports V or 4-20mA) module features 8 differential channels and communicates via ModBus RTU or DCON protocols. M-7033 RTD Input module for 2, 3 or 4-wire RTD Sensors (Pt100, Ni120 or Pt1000) featuring 3 channels and communicating via ModBus RTU or DCON protocols. PM2.5, CO, Temperature and Relative Humidity Data Logger. Touch Screen display. RS485 communications. Standalone or use as part of a monitoring solution. Modbus RTU Protocol supported. Isolated Source-type Digital Output (16 channel) unit, supporting ModbusRTU or DCON protocol. Each channel has a Status indicating LED. Non-Isolated Sink-type Digital Input (7 channel) / Digital Output (8 channel) unit, supporting ModbusRTU or DCON protocol. Inputs can be set as 16-bit counters. Each channel has a Status indicating LED. Isolated Digital Input (16 channel) unit, supporting ModbusRTU or DCON protocol. Inputs can be set as 16-bit counters. Each channel has a Status indicating LED. High accuracy Temperature/Humidity Data Logger with LCD Display, IP66 casing & ModbusRTU RS485 communications for configuration and download. Utility included. Isolated Digital Input (8 channel) unit, supporting ModbusRTU or DCON protocol. Inputs can be set as 16-bit counters. Each channel has a Status indicating LED. Isolated Digital Input (8 channel) / Digital Output (8 channel) unit, supporting ModbusRTU or DCON protocol. Inputs can be set as 16-bit counters. Each channel has a Status indicating LED. Power Relay Output module (12 channel), supporting ModbusRTU or DCON protocol. Each channel has a Status indicating LED. 2 channel Counter/Frequency input module, with 2 Digital Outputs. ModbusRTU or DCON Protocol. 2 channel Counter/Frequency input module, with 2 Digital Outputs. ModbusRTU or DCON Protocol. Virtual Battery backup for Counter mode. tiny Modbus TCP to Modbus RTU / ASCII gateway with a single RS422 / RS485 port. tiny Isolated Modbus TCP to Modbus RTU / ASCII gateway with a single RS422 / RS485 port. tiny Modbus TCP to Modbus RTU / ASCII gateway with a three RS485 ports. tiny Modbus TCP to Modbus RTU / ASCII gateway with a three RS485 ports. Isolated.